Clinton Sparks is back with his 2nd mixtape of 2006 after being recognized by Rolling Stone magazine as one of the Top 10 Mixtape Producers at the end of 2005. He gets the ultimate endorsement here though, as Kanye West gets on board to host this special mixtape prelude to Sparks' Get Familiar, vol. 1 debut album (due out later this year!!). 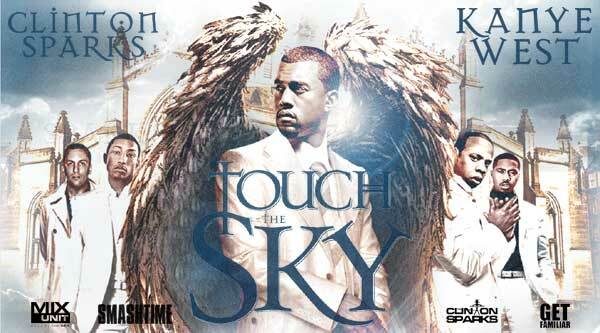 Clinton and the Grammy award-winning artist/producer fly into 2006 with Touch The Sky as the duo serves up an all-exclusive mixtape featuring all original tracks produced by Sparks. Over 30 exclusive tracks featuring Kanye West, Busta Rhymes, Pharrell, N.O.R.E., Notorious B.I.G. & Diddy (new sh*t), Q-Tip, Nas & Jay-Z, Sheek Louch/Styles P/J-Hood, Mike Jones & Slim Thug, Freeway, Kardinal Offishall, Peedi Crakk & Young Chris, Lil' Kim and more. This mixtape also features exclusive freestyles and guest appearances from Sparks' award-winning globally syndicated radio show Smashtime Radio. With Kanyeezy on the co-sign and Mr. Get Familiar behind the boards, all there is left to do is...GET FAMILIAR! Submitted by khamplex on Tue, 01/24/2006 - 9:43am. Hot mix... the only thing that was wrong with it was the bitrate. 128??? Submitted by mfizzel on Tue, 01/24/2006 - 9:53am. Submitted by Viking on Tue, 01/24/2006 - 2:31pm. works for me lol my phone only plays 128 ^^. Nice artists, lets see if mr sparks did something nice..I thinks its worth downloading. Submitted by braydead on Tue, 01/24/2006 - 10:48am. is this worth d/loadin..... got most of clinton sparks's mixtape's, but "GET FAMILIAR" get's sooooooooooooo f#@kin annoying!!!! Submitted by 76er on Tue, 01/24/2006 - 7:22pm. yoooo i gotta have that kanye song "blow your mind" that beat is crazy! who know where that track is complete? Submitted by Bullethead on Wed, 03/15/2006 - 11:58am. No Track Listings??? Whats up with that? Submitted by cyanide on Wed, 06/14/2006 - 11:43am. Submitted by vincentia (not verified) on Mon, 02/18/2008 - 5:11am. clot,edc,33 - Edison Chen - Get Familiar Freestyle (CLOT, Hong Kong),this one is great!really cool! Submitted by DH2VLAD on Fri, 04/18/2008 - 3:32pm. Submitted by craig b (not verified) on Thu, 09/04/2008 - 6:47pm.